The bottom line from the Booz & Company culture study is this: 96 percent said culture change is needed. The challenge is that leaders must go far beyond basic tips, keys, or “levers,” like Booz & Co. highlighted in their study, if there is hope for sustainable culture change. There must be a better way to build pride, drive out fear, and support the purpose and strategy of an organization with effective culture work. We believe the answer is to build your unique culture foundation. We highlighted in our last post that there are plenty of frameworks for managing strategy, talent, leadership, and performance, but not culture. Culture has been this elusive, mysterious subject. Survey action plans, engagement events or programs, and other improvements fall short of building a strong culture foundation the entire organization can understand and manage with clarity and speed. Most leaders of successful cultures learn from experience and other mentors, peers, or experts, how to piece together their improvement approaches because there isn’t a clear guide to follow. While some guides exist, they are not broadly known and applied like other improvement disciplines. 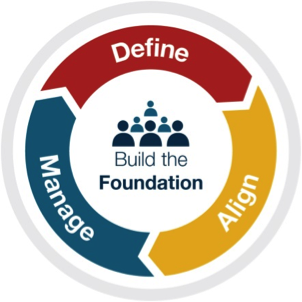 A Define/Align/Manage framework for building a strong culture foundation is outlined in the new book Build the Culture Advantage, Deliver Sustainable Performance with Clarity and Speed. Initial effort is focused on a couple of key behaviors, as Booz suggests in their study and infographic, but broader team effort is must be focused on only 1-2 critical performance priorities so progress and momentum can build. Step 1 – Evaluate your current culture and performance: 1) Define your 1-3 critical performance priorities – e.g. growth, profitability, customer satisfaction, etc. ; 2) identify your 3-5 value/behavior strengths and 3) identify no more than 1-3 value/behavior weaknesses that are holding back your organization from achieving its full potential with the performance priorities you defined. Step 2 – Clarify your initial vision: Define your vision for improving results with only one or two of the performance priorities from step No. 1 and how you will build a culture advantage by leveraging the value/behavior strengths and improving the weaknesses. Clearly communicate how you will work together to improve the weak areas since they are holding your organization back from supporting your purpose and stakeholders. Step 3 – Clarify values and expected behaviors: Define supporting expected behaviors for the 1-3 weaknesses that you identified in step #1. These behaviors would be consistently exhibited in your organization if you were “living your values.” People interpret values from their own perspective so define expected behaviors like Zappos, The Container Store, and others. Step 4 – Clarify strategic priorities: Define and clearly share the 3-5 actionable strategic priorities that your organization will focus on to support the 1-2 performance priorities included in your initial vision from the Define steps. If the performance priority is growth, will it be achieved through new products or services, revised sales strategies, growth with current customers, or other strategies. Employees want and need to understand the big picture. Step 5 – Engage your team in defining SMART goals: Engage your organization and utilize extensive feedback and prioritization to define the objectives that support each strategic priority. These goals need defined in a way to support the expected behaviors for the 1-2 weaknesses you identified from the Define steps. For example, if accountability is a weakness, goals should include more disciplined plans, measures, reviews, recognition, and other approaches to support the behavior you need. Goals also need translated to all levels in larger organizations so people understand how work on their goals and measures impacts the broader organization. Step 6 – Clarify and track key measures: Identify a small number of overall measures that support the one or two top performance priorities from the Define steps. It may help to have one highly visible “unifying metric” even if some employees don’t directly influence it. Step 7 – Maintain a management system for priorities and goals: Most organizations have a system to track or monitor the status of priorities and goals. These reviews need adjusted to focus additional time and attention on the top performance priorities and value/behavior shifts identified in the Define steps. The focus must be on results and supporting the behavior shift through recognition, coaching, removing barriers, etc. Step 8 – Manage communication habits and routines: Transparent, genuine and consistent communication is needed about your performance improvement journey and the role of culture so all employees feel part of the process. Regularly scheduled sessions with two-way communication and extensive informal approaches are needed to emphasize expected behaviors and results. Use these sessions to clarify plans, answer questions, expose rumors and reduce drama. Step 9 – Build motivation throughout the process: Feedback and recognition are critical to the process. Share and celebrate progress in a transparent manner as a standard part of regular communication activities. Confront reality when improvements don’t go as planned and re-engage your team to prioritize adjustments. Nearly all organizations struggle with these foundation areas. Just ask their employees. Gallup reports that 70 percent of employees are not engaged and inspired at work. Hundreds of organizations have completed our one page culture alignment road map and there hasn’t been a single one that said they were effectively managing all of these Define/Align/Manage steps in the eyes of their employees – not one! Many of them manage more progressive approaches that don’t deliver the results they hope due to their weak culture foundation. What are they hiring, developing, and engaging people around if there isn’t a strong and clear culture foundation? Yes, culture is important, most organizations struggle managing it, but don’t think a few “levers” and “keys” come anywhere close to supporting sustainable change. Manage your own culture journey, build clarity and alignment, and stop wasting energy on implementing tips, keys, and levers unless they fit with your unique culture foundation. What approach do you have to manage culture that goes beyond tips, keys and levers? Do you think organizations waste time on programs and silver bullets instead of building a strong culture foundation?